Well, I was wrong about that! As I walked along the shore towards Bill's "hot-spot" I couldn't resist the odd cast into likely looking places. I had hopes of a decent bass and because there had been so much loose weed in the water recently I was using a big Slandra. I was just retrieving after my fifth speculative chuck when I heard a gull squawk. Looking up I saw that black headed gulls, in a small flock, were frantically hovering over the sea about 100 metres further along. I needed no second bidding and within seconds I'd reeled in and was jogging (as well as I could manage in Chesties) to the site of the action. Sure enough the birds weren't pretending and I could see that, close to the edge of the sea, fish were striking and whitebait in a panic were flying out of the water. Out went the Slandra. Bang! Bang! The rod jerked as fish hit the big lure. After the third cast without hooking anything I decided on a change and hurriedly, still with decent bass in mind, switched to an 18cm pearl Evo Redgill. At once I was into a small bass. I took a quick picture and slipped the fish back. The exposed hook of the lure was picking up a bit of weed but on the next cast I had another bass. After that I stopped taking pictures but the bass kept coming. All the fish ranged from about one-and-a-half to three-and-a-half pounds so for a while it was hectic. Despite the change of lures I still missed a fair few bites but the most surprising thing was when I reeled in a mackerel - my first from the place in over fifty years. When I got home I let Bill know that I'd had some fish - eight bass and a mackerel in about half-an-hour. The fish went off as dusk fell just after 21:00hr, presumably because of the failing light. The following evening Bill and I went down together. This time he was using his white Slug-Gill lure, not much different to the Evo Redgill but with a weedless hook and a nose-cone weight. 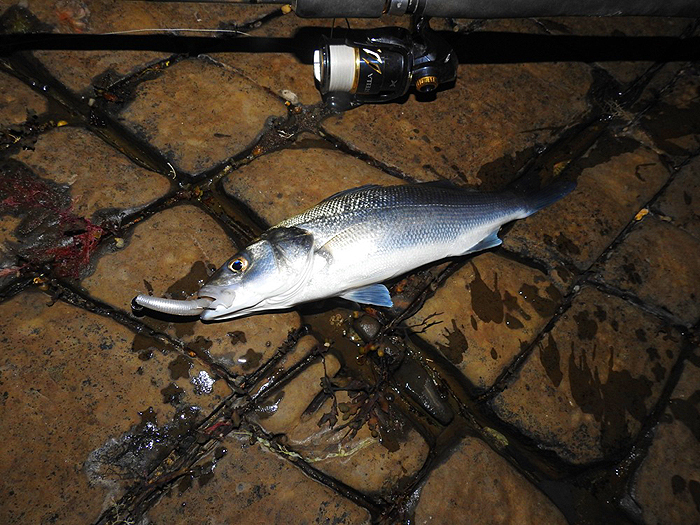 The fish were clearly eating silvery sprats about three inches long so I was fishing with a size 4, silver Mepps, with a single hook instead of the standard treble. Bill was into a bass not long after we started - about 19:15 but the fish didn't really get going until the sun went down. 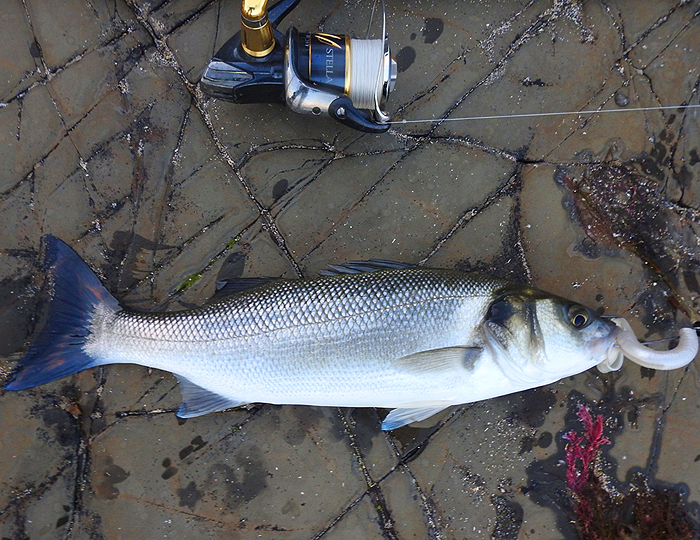 The interesting thing was that Bill's plastic eel produced five bass and one mackerel while my spinner landed ten mackerel and only one tiny bass. 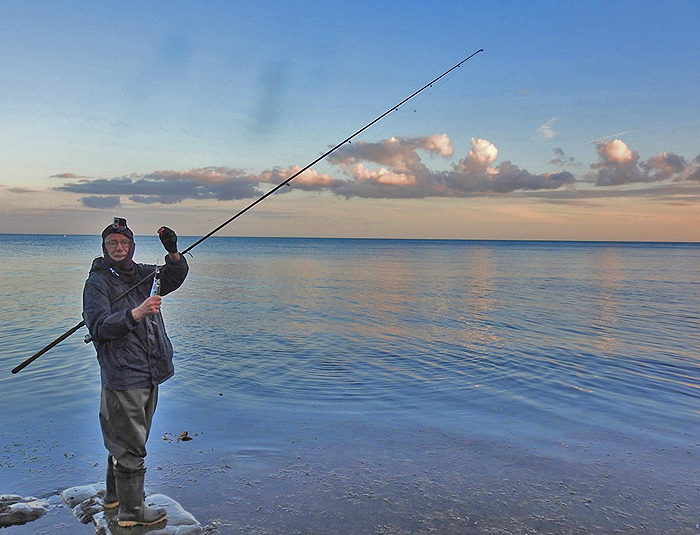 Phil, who was also there, had fished a different spot and managed twelve mackerel but no bass on a small plug. 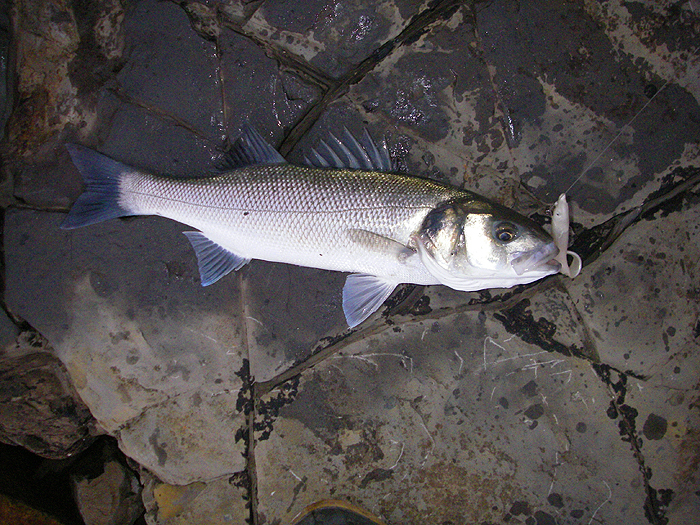 Even though the bass were all small it looked as though the lures were quite selective. 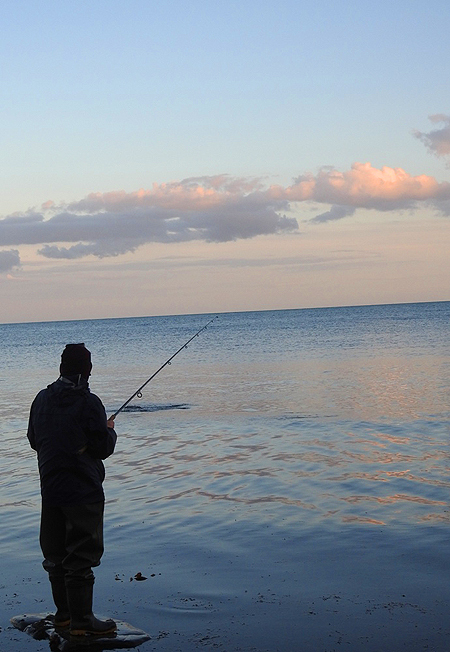 On the following evening, with four of us fishing a variety of lures, there were a lot less fish about. Presumably the tide was now going out of synch with the failing light. 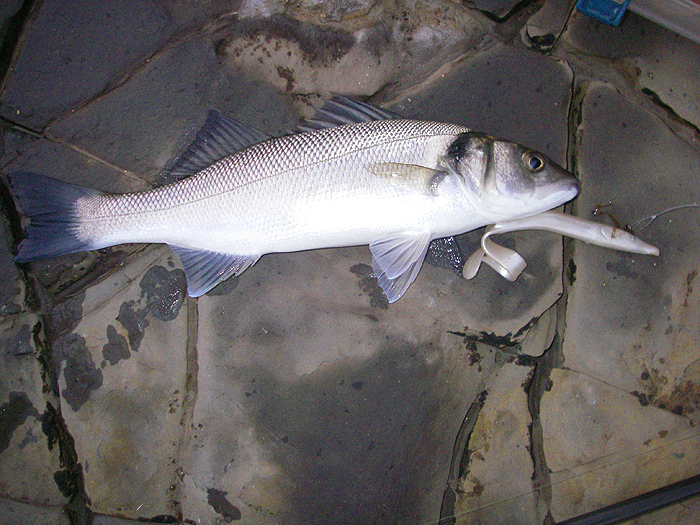 This time, between us, we had two mackerel and a bass on a plastic covered metal spoon, three small bass on a plug, three mackerel on a Lumi-fly and nothing on a big, weedless, plastic eel. I was fishing the fly on my fly rod and floating line and the fish were only close enough to me for about five minutes just before dusk. The first of my eight bass on evening number 1. Another bass on the Redgill. Me spinning with the Mepps on the second session. My first mackerel from here in fifty years. 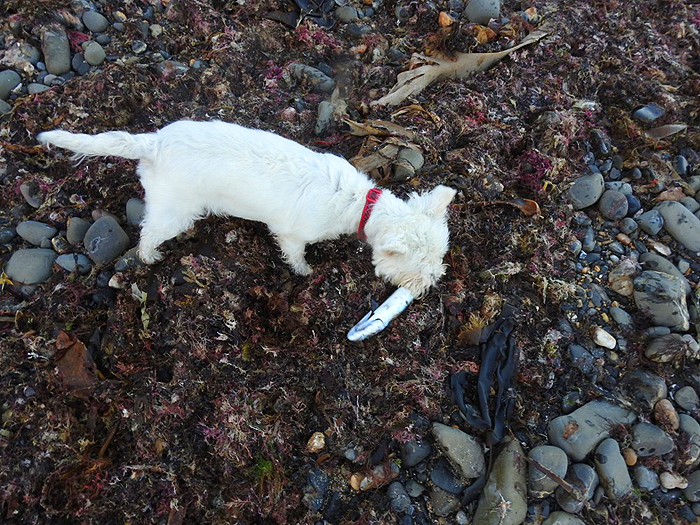 I'd kept my mackerel as potential bait but Poppy decided it was for her supper. A bass on Bill's Slug-Gill.